The Chillout Pod is a single-point hammock chair, perfect for hanging under a deck, on a larger stand, or from a large, overhead branch. The big differentiator on this chair is the easy-to-collapse segmented poles and quick-adjusting hardware device that make it easy to adjust, hang, pack small, and carry. This is one of only a few hammock chairs I’ve ever reviewed and I was really struck by the cool anodized hardware and segmented pole design. Set-up was quick and easy and I really only needed to look at the instructions to ensure the quick half-hitch was done correctly. The company has some good videos that show the set-up. The suspension rope is long enough for really tall hangs, but the real trick is using the webbing strap. I’m glad they included a nice carabiner and webbing strap, but if the hang is too high, it’s not really convenient to use. Sitting in the chair wasn’t as easy or comfortable as I would have liked. The spreader bar was right behind my head and I had to duck to get in (being careful not to pull on the pole!). The fabric was also tight under my seat. I found the most comfortable mode was by tucking my legs inside. Since the chair fabric is easy to remove, I tried using other hammocks in place. This proved interesting as some hammocks work better than others. I found that a wide but short hammock was the best so I could get more fabric behind me to lay. A five or six foot wide hammock was the best. Narrow hammocks didn’t curl up enough to make it worth the effort. The stock chair fabric is okay, but it’s nice to know that you can make modifications if you want. Speaking of mods, I was intrigued about using lightweight-but-strong 7/64″ Amsteel (Dyneema) cordage. In this way, I could use a regular hammock but make the whole kit a little lighter. I could also use carabiners to clip to the ends of the spreader bar to make quickly clipping a hammock off and on a possibility. This is only really necessary if you feel compelled to switch out the hammock, or use your favorite hammock as a chair/lounger in a single point configuration. In a nutshell, there are a lot of modular options you can do thanks to how the spreader bar and device are designed. Suspension and Anchor System ★ ★ ★ ★ ★ The suspension system and hardware (including the collapsible pole) are really nice. The inclusion of the webbing strap is nice, but tricky to use on high branches. The stuff sack doubles as a throw bag. Construction and Craftsmanship ★ ★ ★ ☆ ☆ Mass-market construction. Good craftsmanship; straight, even stitching; triple-stitched and reinforced; quality materials. Some stray threads. Modularity ★ ★ ★ ☆ ☆ The fact that you can easily swap out the chair fabric and make changes make this a nice option for converting a hammock you already own (if you don’t like the stock fabric). Aesthetics ★ ★ ★ ★ ☆ Typical color options from v1.0 ENO hammocks. Price and Value ★ ★ ★ ☆ ☆ Offshore production, but prices are a littler higher than generic hammock chairs. It’s packability is nice and makes it more portable. The suspensions system and pole are definitely stand outs. 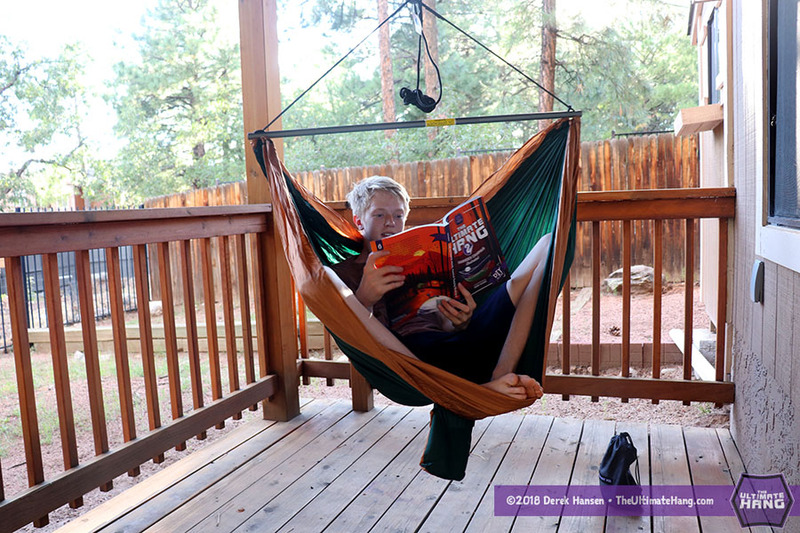 Your web site and Ultimate Hang book make for a fantastic resource!